Prepare cake batter as directed on package. Stir in cookie crumbs; spoon evenly into 24 paper-lined medium muffin cups. Bake as directed on package for cupcakes. Cool completely. Frost cupcakes with the whipped topping. 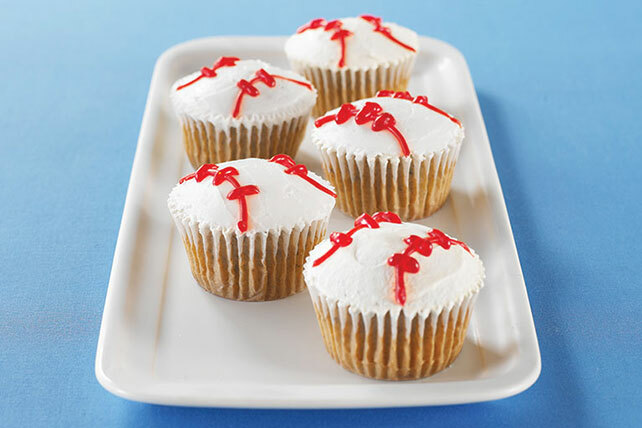 Use decorating gel to draw stitching lines on top of each cupcake to resemble a baseball. Store in refrigerator. Make sure cupcakes are completely cooled before frosting. A warm cake can cause the frosting to soften or melt. Prepare as directed, using your favorite flavor of cake mix.